But Jake Haener might have been best. 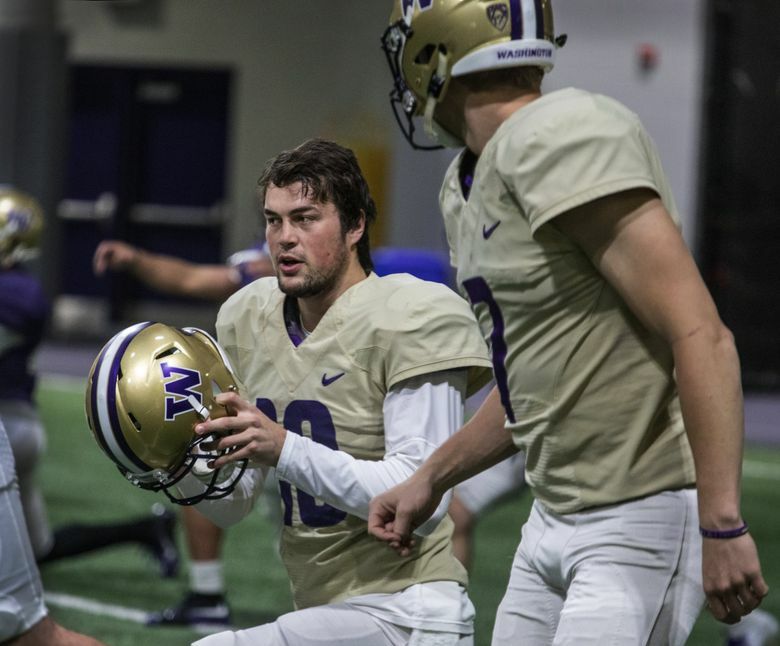 For the first time this April, Eason — a 6-foot-6, 228-pound junior quarterback — took the first reps with the starters in Washington’s sixth spring practice on Friday morning. But Haener — who had previously received the first starting reps — was slightly sharper, completing 14 of 17 passes in 11-on-11 and seven-on-seven scrimmage drills (including each of his first 13 attempts). The highlight might have been an 11-on-11 play in which Haener was pressured out of the pocket, rolled to his left, stalled for time along the sideline and then found tight end Hunter Bryant over the middle for a significant gain. Eason, meanwhile, finished 7 for 12 in scrimmage drills. Two of those incompletions were batted down by senior defensive back Myles Bryant, who nearly made an acrobatic interception of one Eason pass intended for tight end Jacob Kizer. Bryant practiced as UW’s starting free safety for the third consecutive practice. Neither Eason nor Haener threw a touchdown or committed a turnover Friday. Redshirt freshman quarterback Jacob Sirmon also received a drive with the starting offense late in practice, though he failed to complete a pass. Sirmon also threw the offense’s only interception of the day, a jump ball in the end zone that defensive back Dustin Bush ripped away from wide receiver David Pritchard. Here are some more observations from Friday’s practice. There were a couple new starters on display Friday. With Bryant and Brandon McKinney manning the safety position, Elijah Molden again shifted to nickel and junior Keith Taylor operated as one starting corner. Redshirt freshman Kyler Gordon claimed the spot opposite him Wednesday, but Dominique Hampton took his turn with the starters Friday. Defensive coordinator Jimmy Lake said after practice Wednesday that both Gordon and Hampton would get opportunities with the first team. Elsewhere, junior defensive lineman Levi Onwuzurike participated in individual drills Friday but sat out the scrimmage drills. With Onwuzurike apparently limited, Josiah Bronson and John Clark started on the defensive line, and redshirt freshmen Sam Taimani and Tuli Letuligasenoa both cycled in as well. With center Nick Harris still limited, he and sophomore Cole Norgaard continued to share reps with the starters on the offensive line. Senior Jared Hilbers held down the starting right tackle spot for the sixth consecutive practice. When senior inside linebacker Brandon Wellington took a scrimmage play off Friday, redshirt freshman M.J. Tafisi briefly replaced him with the starters. Washington nearly lost two starters on the same play Friday. During a scrimmage drill late in practice, early enrollee freshman quarterback Dylan Morris misfired on a pass attempt intended for wide receiver Chico McClatcher. Starting nickelback Elijah Molden and safety Brandon McKinney each closed on the ball at top speed and collided, forcing both players to the turf. Molden and McKinney were slow to get up and trot to the sideline, but both players returned and participated fully. Looking for a spring sleeper? Redshirt freshman walk-on linebacker Edefuan Ulofoshio — who forced two fumbles in three games last season — finished with a sack in his second consecutive practice, charging through the middle of the offensive line to corral quarterback Colson Yankoff. The 6-foot, 233-pound linebacker — who appears to be cross-training at both the inside and outside spots — has showcased some impressive burst and decisiveness in the pass-rush. Fifth-year senior Benning Potoa’e also secured a pair of sacks Friday. Clark, Ryan Bowman, Tafisi and early enrollee freshman linebacker Josh Calvert all finished with a sack as well. That means there have been some significant early spring struggles for UW’s second- and third-team offensive lines. Jacob wasn’t the only Sirmon who showed up on offense Friday. Redshirt freshman linebacker Jackson Sirmon also flipped over for a few reps at a makeshift fullback spot. The 6-3, 224-pound linebacker even caught a short pass out of the backfield from Eason. As for other formations, UW experimented more with the option Friday and also incorporated a wildcat look, most notably with running back Richard Newton faking a hand off to McClatcher on an end-around and bursting up the middle for a big gain. The Huskies also worked occasionally with two running backs in the game simultaneously. Again, wide receivers Ty Jones and Aaron Fuller missed practice Friday with an injury, allowing Andre Baccellia and Terrell Bynum to operate as the starting wide receivers. And while he didn’t do much Friday, senior wide receiver Quinten Pounds — who is recovering from a third torn ACL — continued to trend in the right direction and ran a couple individual routes. Outside linebacker Myles Rice, safety Julius Irvin, linebacker Miki Ah You, outside linebacker Zion Tupuola-Fetui and defensive lineman Sama Paama were all limited. Early enrollee freshman offensive lineman Troy Fautanu also walked off with an apparent injury. — Junior Isaiah Gilchrist — who has also lined up at safety and cornerback this spring — played nickel Friday and turned in tackles for loss on back-to-back plays. — Sophomore placekicker Peyton Henry was 1-for-2 on consecutive 28-yard field-goal attempts. — The longest pass completion of the day appeared to go to Sirmon, who found wide receiver Jordan Chin sprinting past safety Alex Cook along the left sideline for a significant gain. — Safety signee Asa Turner attended his second consecutive practice Friday. Preferred walk-on defensive back and Seattle product Mishael Powell also watched practice, as did recently departed safety Drew Sample. — The following players caught punts Friday: Sean McGrew, Salvon Ahmed, Richard Newton, Trey Lowe, Andre Baccellia, Kyler Gordon, Chico Mcclatcher and Aaron Fuller. — Much of Eastside Catholic’s football team attended the practice Friday. Washington head coach Chris Petersen gives updates on the Huskies after day 6 of spring football practice.